Songwriter and singer Joe South died on 5 September 2012 at the age of 72. The cause was a heart attack. Joe South was born Joseph Souter on 28 February 1940 in Atlanta, Georgia. He was only eleven years old when his father gave him his first guitar. By the time he was twelve years old he was performing on local radio stations. Not only was he musically inclined from a young age, but he was also technologically inclined. He built his own limited range radio transmitters so he could play his music. It was in 1958 that Joe South would have a minor hit with the novelty song "The Purple People Eater Meets the Witch Doctor," which went to #47 on the Billboard Hot 100. Although he was a singer and performer, Mr. South's biggest impact may have been as a songwriter. It was in 1959 that he wrote two songs for Gene Vincent: "I Might Have Known" and "Gone Gone Gone." Joe South would have several hits performed by other artists, for whom he either wrote songs or who simply covered a song he had originally recorded. Billy Jo Royal would have hits with the Joe South penned songs "Down in the Boondocks", ""Yo-Yo," , and "Hush." The Raiders would have a hit with his song "Birds of a Feather." Brook Benton would do very well with "Don't It Make You Want To Go Home." Elvis Presley would later cover Joe South's song "Walk a Mile in My Shoes." Joe South's most successful song that he penned for someone else may have been "Rose Garden," which crossed over from the country chart to the pop chart. Joe South also worked as a session musician for many years in the Sixties. He played on such songs as "Sheila" by Tommy Roe and "Chain of Fools" by Aretha Franklin. Bob Dylan was among the artists with whom he worked, as well as Marty Robbins, Wilson Pickett, and Eddy Arnold. It was in the late Sixties that Joe South's career as a singer and performer began to take off. He had a hit with the song "Games People Play," which went to #12 on the Billboard pop charts. He would have further, minor hits with "Don't It Make You Want to Go Home," "Walk a Mile in My Shoes," and "Fool Me." He recorded his first album, Introspect, in 1969. He would follow it up with Games People Play, Don't It Make You Want to Go Home and Joe South. His later albums would not perform nearly as well as his early albums, although he recorded several more. While I cannot say I liked every song Joe South wrote, I do believe he was a very talented songwriter. Indeed, he wrote songs in such genres as rock, folk, and country. What may have been his biggest hit, "Rose Garden," was definitely country, but "Games People Play" was definitely rock. This versatility allowed him to write for vastly different artists and also to perform in different genres himself. I made a new video today. This one is Material Issue's cover of The Grass Roots' "I'd Wait a Million Years" set to clips of wife and husband Amy Pond and Rory Williams from Doctor Who. For those of you unfamiliar with the series, at one point in its run Rory had to literally wait 2000 years for Amy. This song then seemed particularly fitting. Anyhow, without further ado, here is the video. I feel a bit under the weather tonight, so rather than write a full blog post I thought I would bring you the good news that series 3 of Downton Abbey will debut on ITV 1 at 9 PM on 16 September. Sadly, here in the United States we will still have to wait until January. Anyhow, here is the extended trailer for Downton Abbey series 3. In 1942 Hollywood movie star Hedy Lamarr and avant-garde composer George Antheil received a patent for what was called a "secret communication system." That invention would pave the way for spread spectrum technologies today, from mobile phones to GPS. Hedy's Folly: The Life and Breakthrough Inventions of Hedy Lamarr, the Most Beautiful Woman in the World by Richard Rhodes details how these two unlikely people would create something that would revolutionise the world. It is a fascinating story and one that was not widely known until the late Nineties, and even then only among a very few familiar with the history of communications technology or the career of Hedy Lamarr. In 1942 Hedy Lamarr was one of MGM's biggest movie stars, proclaimed "the Most Beautiful Woman in the World." George Antheil was a well known composer and writer who was struggling to make ends meet. What the two shared was an interest in technology and a knack for invention. Together they developed a new torpedo guidance system whereby a torpedo would be guided by radio signals that would hop from frequency to frequency. In effect this would make the radio signals that guided the torpedo to its target nearly impossible to jam. Miss Lamarr and Mr. Antheil's invention probably provided the basis for every technology that has depended upon "frequency hopping" or spread spectrum techniques ever since, from WI-Fi to automotive electronic systems to mobile phones. Hedy Lamarr and George Antheil also developed a n anti-aircraft shell fixed with a proximity fuse that would use radar to detect the target and detonate at a predetermined distance away. It would never be put into practical use. Given that Hedy's Folly concentrates on Hedy Lamarr and George Antheil's invention of what could have been the first practical technique for frequency hopping and spread spectrum, one should not expect a typical Hollywood biography. Richard Rhodes covers the two inventors' pasts in some detail, but for the most part Hedy Lamarr's film career and George Antheil's composing and writing careers are only background for the book's primary concern (their invention of a "secret communications system"). Mr. Rhodes goes into a good deal of detail on their invention, including their relationship (which was strictly "just friends," in case you're wondering). This naturally means explaining the technical details of their invention, a feat which Richard Rhodes accomplishes admirably. Unlike many writers dealing with science and technology, Mr. Rhodes explains the details of Hedy Lamarr and George Antheil's secret communications invention, as well as other technologies, in language that is simple and easy for the layman to understand. Of course, here I must state that Richard Rhodes has a very readable writing style, whether discussing Hedy Lamarr's film career or various technologies. Not only is Hedy's Folly very readable, but it shows that Richard Rhodes did his research. He used biographies, letters, unpublished memoirs, newspaper articles and other print sources for much of the grounding of the book. He also conducted interviews and visited the places where Hedy Lamarr and George Antheil lived. While many are already familiar with even the tiniest details of Miss Lamarr and George Antheil's invention, there is still enough new information in the book that even the biggest Hedy Lamarr fan might learn something new. For those who know little about Hedy Lamarr and George Antheil's invention, the book will prove very informative on multiple levels. 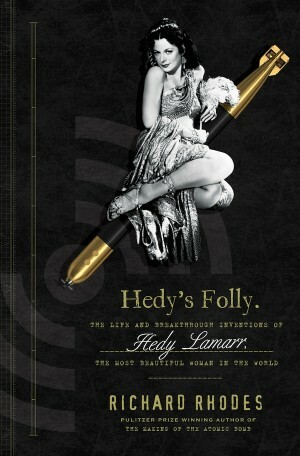 If there is one criticism I have of Hedy's Folly, it is that it does seem to end all too soon. Mr. Rhodes does an admirable job of covering the further development of frequency hopping and spread spectrum techniques would have and he also does an admirable job of covering the impact that Miss Lamarr and Mr. Antheil's invention would have on the modern world. That having been said, I would have liked to have seen a bit more coverage of Hedy Lamarr's other inventions (everything from a cube that when dropped into a glass of water would become a cola drink to a new sort of traffic light), as well as a little bit more on the later careers of Hedy Lamarr and George Antheil. Here I must stress that this is only a minor criticism. The book is a great read as it is. Whether one is a tech geek or a classic movie buff, I cannot recommend Hedy's Folly enough. It provides insight into what was once a little known facet in the lives of both Hedy Lamarr and George Antheil in a format that is easy for even those unfamiliar with spread spectrum technology to understand. I must confess that once I started reading Hedy's Folly I had real difficulty putting it down. I'm sure most readers will be the same. Actor Michael Clarke Duncan died today, 3 September 2012, at the age of 54. The cause was a heart attack. Michael Clarke Duncan was born on 10 December 1957 in Chicago. He was only 5 years old when his father left his family. He was raised by his mother and his older sister. His mother had wanted to be an actress and so she encouraged him to take up acting. He went to Kankakee Community College in Kankakee, Illinois and Alcorn State University in Lorman, Mississippi, but did not graduate as he had to go back to Chicago to help support his family. He worked as a ditch digger for the the Peoples Gas Company and a bouncer at various nighclubs. Eventually he moved to Los Angeles to pursue his acting career, where he initially worked as a bodyguard for such stars as Will Smith and Martin Lawrence. Michael Clarke Duncan made his debut in an episode of Renegade. Over the next few years he guest starred on such shows as The Fresh Prince of Bel-Air, Married with Children, The Jamie Foxx Show, and The Wayan Bros. He appeared in the films Friday (1995), Back in Business (1997), and Caught Up (1998), The Players Club (1998), and Bulworth (1998). It was with the film Armageddon (1998) that Mr. Duncan graduated from bit parts to more substantial roles. He appeared in the films A Night at the Roxbury (1998) and Breakfast of Champions (1999) before his breakout role as John Coffey in The Green Mile (1999). He appeared the following year in the remake of The Whole Nine Yards (2000). In the Naughts he appeared in such films as See Spot Run (2001), Planet of the Apes (2001), The Scorpion King (2002), Daredevil (2003), Pursued (2004), D.E.B.S. (2004), Sin City (2005), One Way (2006), The Last Mimzy (2007), Slipstream (2007), The Slammin' Salmon (2009), and Redemption Road (2010). He did voice work on such animated films as Kung Fu Panda (2010) and such animated TV series as Spider-Man, Static Shock, Teen Titans, and Loonatics Unleashed. On television he guest starred on such shows as King of the Hill, George Lopez, C.S.I. NY, and Two and a Half Men. In the Teens Michael Clarke Duncan was a regular on the series The Finder. He guest starred on the series Bones. He appeared in the films Green Lantern (2011), From the Rough (2012), and The Loud: Around the Time (2012). His final three films are to be released later this year and next year: In the Hive (2012), The Challenger (2012), and Criminal Empire for Dummy's (2013). 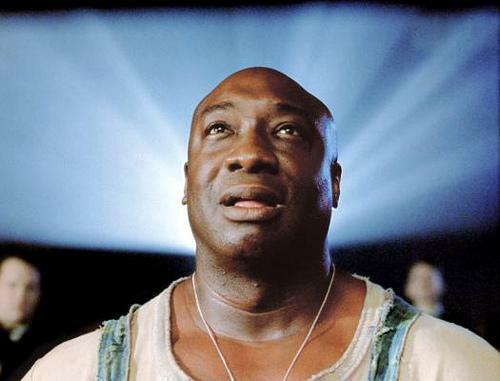 Michael Clarke Duncan was an extremely talented actor with a large range he could play. He gave an extraordinary performance as gentle giant John Coffey in The Green Mile and yet he could also play the Nubian warrior king Balthazar in The Scorpion King just as convincingly. Even when a film wasn't that good, such as the case with Daredevil, he still gave an impressive performance. It is very sad to know that we will see only a few more great performances from Mr. Duncan.